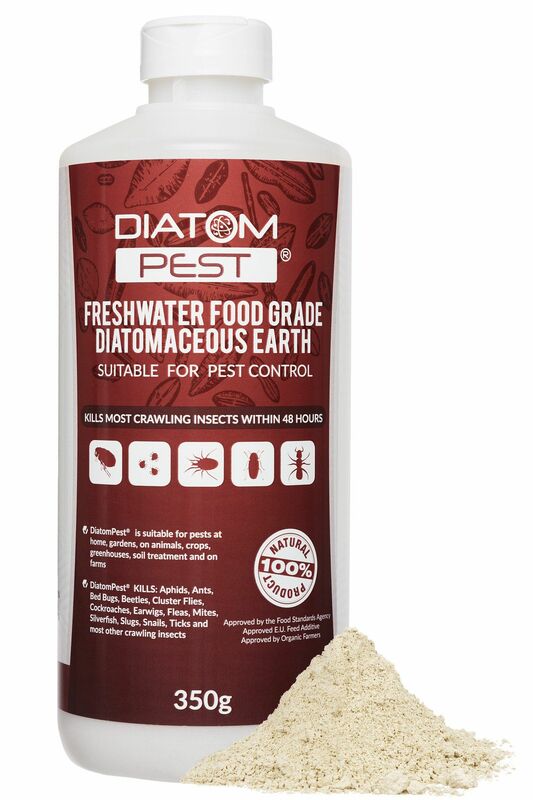 DiatomPest Diatomaceous Earth powder is organic and effective in killing most crawling insects in 72 hours including: Earwigs - Mites - Flies - Ticks - Bed Bugs - Beetles - Silverfish - Ants - Snails - Slugs - Cockroaches and many more. DiatomPest is 100% safe to use in the house around people, babies, pets and animals. Reported to kill 85% of flies and fleas that come in contact with it within 72 hrs. It's a fast acting and 100% natural organic product that does not contain any harmful chemicals at all. DiatomPest powder is 100% safe and because the particles are so small, they cause no harm to people and pets. Just like any other dust it is not advisable to inhale it or get it in your eyes so we recommend using a dust mask from our accessories page. It is a simple natural mineral called Silica.